If you&apos;ve ever considered owning a personalized, custom carved gunstock, you&apos;re come to the right place. 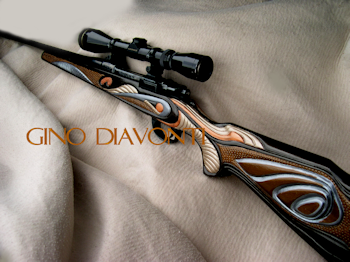 Gino has been carving and sculpting all types of mediums for about 40 years now. Wood was his first attempt, and he has certainly mastered it. From an old tyme Western theme, the game your are hunting, to even your name, Gino is able to easily transfer the thought from your head to the wooden stock of your favorite gun. The gunstock can then be stained and sealed. It can also be painted with metallics or other types of paints. The ceiling is the limit. The process can take anywhere from 2 weeks to 2 months, depending upon how large the gunstock is, and how intricate is the work you want created. If you are interested in owning your own original carved and finished gunstock worked by Gino, please visit the Contact page and send him a message, or give him a ring.